This post is part of the A2Z Challenge. The plan to visit Calicut was laid on a Thursday night, and hatched the very next night. The brother-in-law works at NIT Calicut, and he had been inviting us to visit for a long time. I've been to the city at least twice before, and it had impressed me on neither of those occasions - the beach there is one of the dirtiest I've ever set foot on. But this time, the brother-in-law promised me a better trip. We left on a Friday night, in an over-air-conditioned white bus. The first I saw of Calicut district was through sleep-filled eyes on a grey Saturday dawn. Our bus was descending a hill, moving alternately through patches of dark forest and open air. When the trees weren't hiding the view, the plains stretched out beneath us. Mist still clung to mounds of greenery. We were at hairpin number 7/9, I saw. The road was well-maintained, and empty at this hour. Which was good, because the bus had to stop and reverse at a couple of the other hairpins. All too soon, we were at the base of the hill. The village had clearly been named by somebody imaginative - it was called Adivaram (Base of the Hill, in Malayalam). On we went at a reckless pace, and soon reached Thamarasseri town. 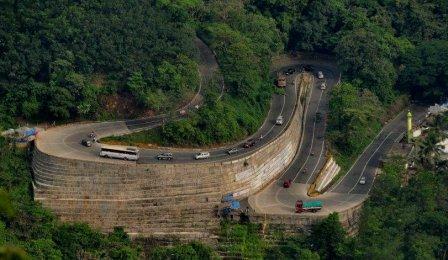 It was then that I realized that we had been descending the famous Thamarassery churam (pass). It connects Wayanad and Calicut districts. I know very little Kerala history, but even I was aware that this was the pass through which Pazhassi Raja had fled the British. I found this wonderful photo of the churam online. We had to get off the bus at Kunnamangalam, which is about twenty kilometers from the main Calicut town. Tiny though the place is, it's almost an educational pilgrimage town - IIM Kozhikode is situated here, and NIT Calicut is seven kilometers away. Rather than stick to Calicut, we decided to catch what we could of Wayanad district. Edakkal Caves, though not the closest of the tourist spots in Wayanad, was the obvious choice - it offered history, greenery and a nice trek. Off we went again through the churam. Wayanad is relatively unspoilt, and one of the most beautiful places in Kerala. The place abounds in home-stays and resorts. There are plantations aplenty, and enough and more tourist 'spots'. I've been to Wayanad twice before, but mostly in the north of the district. This time, we were in the southern part. We passed through some of the places that I'd only heard of before, such as Vythiri (famous for its resorts) and Kalpetta (the district headquarters). We turned off the National Highway 212 at Meenangadi (the name translates as Fish Market!). On the return journey, we got stuck in a traffic jam. We had left Edakkal at three-thirty, and had unsuccessfully tried to get to two waterfalls on the way. We got lost on our way to the first one, and the second one was closed for entry by the time we got there - every one of these places apparently shuts down by five in the evening. So by the time we hit the churam again, it was almost dark. We had hardly reached the second hairpin when the traffic jam started - a long line of buses and trucks and cars, all standing stationary on the side of the hill. I thought there must have been some accident, but it turned out I was wrong. The traffic jam had been caused by the fact that buses and trucks need to reverse at least a couple of times to cross hairpins! That night, tired though we were (especially the poor brother-in-law, who had been driving all day), we had to complete a ritual that is apparently mandatory for visitors to Calicut - having dinner at the Paragon restaurant in the city. Continuing on the theme of food, breakfast the next day was horrible. We had some shopping to do in the city. The brothers seemed to not want breakfast, but I'm a firm believer in (and practitioner of) the 'Breakfast like a King, Lunch like a Prince, Dine like a Pauper' principle. So I grew hungry pretty quickly, and asked them to take me to the first restaurant I saw - a place called Sagar. Possibly because of the Shanthi Sagars and Sukh Sagars of Bangalore, I thought it would be a vegetarian restaurant, and dreamt of warm masala dosa and sambar. It turned out that Sagar is famous for anything BUT vegetarian. They had biriyani and porotta-non-veg curry combos for breakfast, for God's sake! And the place smelled like a butcher's shop. I suddenly realized that I was in the Land of Non-vegetarian Food. (At least one Tam-Brahm I know gave up his vegetarianism during his four years at NIT Calicut.) But seriously, how can anyone eat meat for breakfast? Gross. The brother-in-law also took us to a temple near NIT Calicut. It's somewhere on the NIT to Kunnamangalam Road - a left turn along a rutted track so narrow that our car barely scraped through. But the place is worth it. A few hundred meters in, the path ends in a rice field. Though the rice had just been harvested when we went there, the place was exceptionally beautiful. I could swear that we saw every shade of green that day - from the light green of banana leaves to the dark green of coconut leaves. Across the field, we could see the yellow walls and brown tiles of the temple. We couldn't go in, because they have a dress code (men have to be wearing mundu and women have to be in saris), but it was extremely peaceful. The return bus journey was eventful. Since we didn't want to travel twenty kilometers to Calicut city to catch a bus that would in any case be passing our way, we told the bus driver that we would wait in front of IIM Kozhikode. We waited suitcase in hand for almost an hour before the bus came long - at eighty kilometers per hour! It zoomed past us like the proverbial hare. We ran to the car, threw in the suitcase, and chased the bus on the highway, all the while trying to get through to the driver. He finally stopped a few kilometers ahead, and let us enter. Apologies for the lack of pics of the place. We left the camera behind for the brother-in-law, and couldn't transfer the photos before leaving. Stopping in from the A to Z! I did like the photo you included of the twisty route you took. Wow!